Rakusan did not include the Fan Series in his main sequence numbering. Therefore, the original number used for each of the 36 Series prints has been modified to identify the Fan Series members of its theme. The five different fan silhouette shapes have been here assigned arbitrary numbers 1 through 5. To indicate a fan design these shape designations are added to the 36 Series number separated by a hyphen. 122-5 is the Fan Series design with fan shape 5 in the 122 Wild Plum theme. Like all other designs in this series, 122-5 was only produced in a single print run, and few copies are currently documented. The 122 Wild Plum theme is one of three different themes based on flowering plums. (The other two are 123 Red Plum and 124 Bonsai Plum.) Because the Fan Series prints for all three of these themes were delivered as a single installment, it can be very difficult to assign the individual, loose, flowering plum designs to their appropriate themes. In monochrome prints the color of plum blossoms is uncertain, and of course a bonsai plum can be any color. [The theme assignment of 122-5 is uncertain, and it is possible that the designs currently labeled 122-5 and 123-5 should be exchanged.] Although there are a total of fifteen plum fan designs divided among the three themes, it remains possible that the number of designs in each may be irregular. However, there are exactly three designs of each fan shape, and there is no evidence that the installment consists of anything other than three entirely regular themes each with a complete fan quintet. The individual designs were completed in at least two different stages. The theme assignment issues and the signature and seal markings of the flowering plum designs suggest that their Fan Series prints are best considered together as a single unit of fifteen designs. Fully thirteen of the fifteen Fan Series designs (including 122-5) have seal C which indicates a carving date during the first half of 1934. The other two fan designs have rare minor seals whose carving periods remain to be determined, one example each of seal Q and seal R. They may in fact both also be from within the same major seal C period (which would make all of the plum fan designs contemporaneous). After preparing the wooden blocks for these relatively early designs, Rakusan set them aside for several months. Two of the three 36 Series flowering plum designs, 122 and 123, have seal B which indicates they were not carved until the following period, and perhaps not until shortly before their publication with the Fan Series designs later in the year. The third 36 Series flowering plum design, 124, is the sole woodblock print example of minor seal D whose carving period is indeterminate between the sequential major seal C and seal B periods. The composition of 122-5 includes an old branch of a flowering plum. Sitting on the branch is a male redstart with his feathers fluffed up (which was one of the ways Rakusan indicated cold temperature). Hanging from a different branch is a bagworm. All of the elements are carved in great detail; even some of the silk used by the bagworm is shown as individual threads. 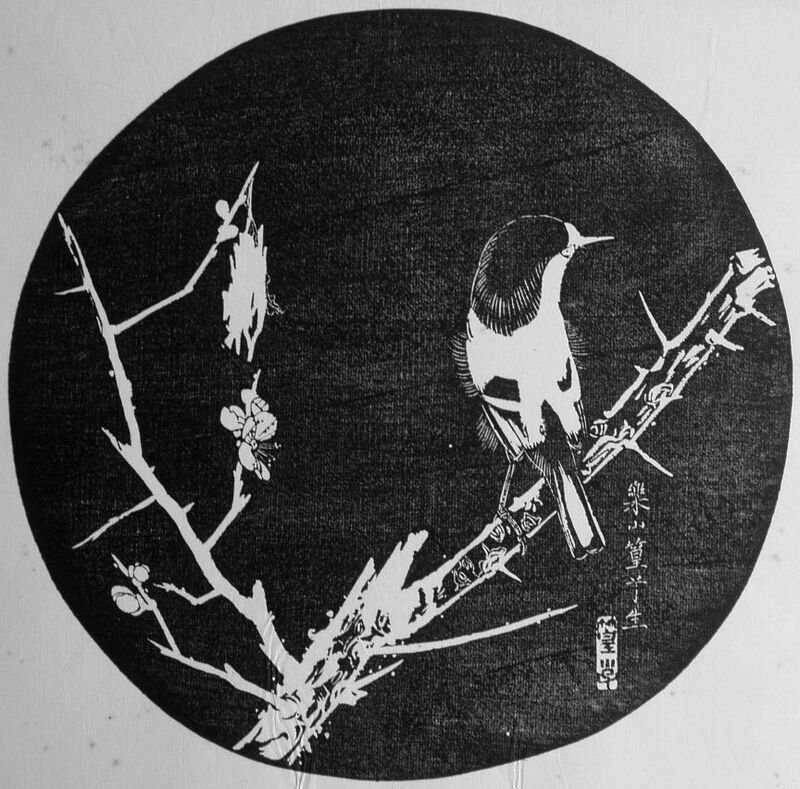 The ishizuri version of the redstart is an exact negative of the original sketch which had the natural color patterns. Daurian Redstart, Phoenicurus auroreus, 尉鶲, 常鶲, 上鶲, じょうびたき, ジョウビタキ, jou-bitaki, is a native Japanese species. The original spelling of the name is likely to have been 尉鶲, jou-bitaki, lit. 'oldman flycatcher', because of the gray top of the head of the male bird. 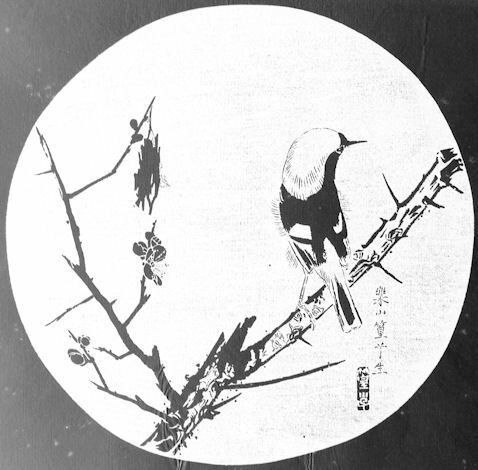 In 100 Series design 61 Rakusan called these birds simply 鶲, hitaki, 'flycatcher', which is a general name used for many similar birds, including the redstarts. It is likely that a redstart sketch prepared for 61 was repurposed here. The old growth of flowering plum trees is often embellished with lichen and fungi in these prints, and a few have evidence of small animal life. In 122-5 there is a chrysalis of Bagworm Moth, (family Psychidae), 蓑虫, みのむし, ミノムシ,mino-mushi, lit. 'straw-raincloak insect'. Its caterpillars conceal themselves beneath a bag-like cloak of twig and leaf litter held together with silk.